You can analyze circuits with dependent sources using node-voltage analysis, source transformation, and the Thévenin technique, among others. For analyzing circuits that have dependent sources, each technique has particular advantages. Using node voltage methods to analyze circuits with dependent sources follows much the same approach as for independent sources. Consider the circuit shown here. What is the relationship between the output voltage vo and is? The first step is to label the nodes. Here, the bottom node is your reference node, and you have Node A (with voltage vA) at the upper left and Node B (with voltage vB) at the upper right. Now you can formulate the node voltage equations. To see the source transformation technique for circuits with dependent circuits, consider Circuit A as shown here. Suppose you want to find the voltage across resistor R3. 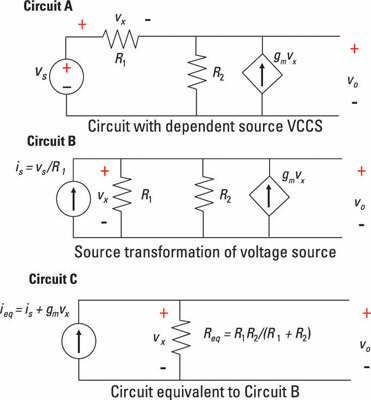 To do so, you can perform a source transformation, changing Circuit A (with an independent voltage source) to Circuit B (with an independent current source). You now have all the devices connected in parallel, including the dependent and independent current sources. Don’t use source transformation for dependent sources, because you may end up changing or losing the dependency. You need to make sure the dependent source is a function of the independent source. The independent current source is and the dependent current source gvx point in the same direction, so you can add these two current sources to get the total current ieq going through the resistor combination R1 and R2. The total current ieq is ieq = is + gmvx. Because vx is the voltage across R2, vx is also equal to vo in Circuit B: vo = vx. See how the output voltage is a function of the input source? The final expression of the output should not have a dependent variable. 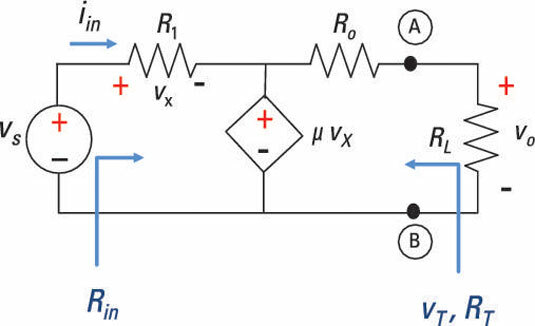 The Thévenin approach reduces a complex circuit to one with a single voltage source and a single resistor. Independent sources must be turned on because the dependent source relies on the excitation due to an independent source. To find the Thévenin equivalent for a circuit, you need to find the open-circuit voltage and the short-circuit current at the interface. In other words, you need to find the i–v relationship at the interface. To see how to get the Thévenin equivalent for a circuit having a dependent source, look at this example. It shows how to find the input resistance and the output Thévenin equivalent circuit at interface points A and B. When μ is very large, the Thévenin voltage vT equals the source voltage vs.